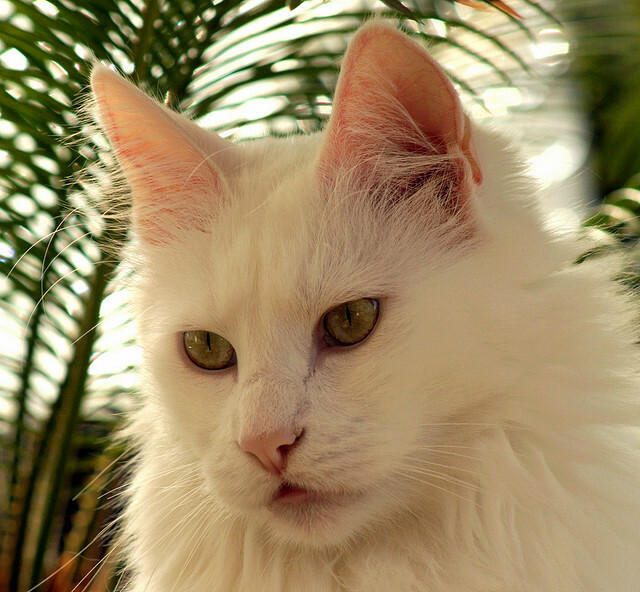 Totally white cats are more likely to be born deaf. This is because the development of the hearing mechanism is defective due to the presence of the gene that causes the cat to be white. Sometimes deafness is in one ear. A cat does not have to be completely white to be deaf in, say, one ear. White cats have blue eyes because the blue eyes are caused by the same gene that stops the production of pigment. Obviously not all blue, white eyed cats are deaf. They are just predisposed to deafness. Congenital deafness is said to be due to “an incomplete autosomal dominant gene“. 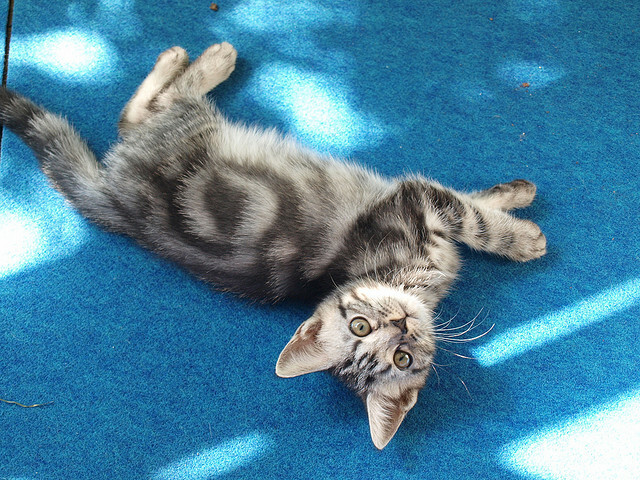 Longhaired, blue eyed cats are more likely than shorthaired blue cats to be born deaf. Siamese cats are a type of albino cat (all white) but are not susceptible to deafness. Obviously, breeders avoid creating deaf cats. There are some breeds that are said to “have the white coat pigment gene” and are therefore at a higher risk of deafness1. The quote comes from the respected Cat Owner’s Home Veterinary Handbook (page 218 ISBN 978-0-470-09530-0). However, white coats are due to a lack of pigment which in turn is due to a lack of pigment-producing cells. The description, therefore, appears to be inaccurate. However, the list below is of cat breeds that have a risk of congenital deafness. In the United States of America you might like to contact George Strain Ph.D. at the veterinary at Louisiana State University who is an expert in this field. Obviously this advice is time sensitive as Dr. Strain will retire one day! Accordingly, at the time you try to make contact, the situation may have changed. Testing cats for deafness can be carried out using the brain stem auditory evoked response (BAER) test. Your local veterinary college may have the facilities to carry out this test. The cat’s brain waves are tested using an electroencephalogram (EEG) which records the brain waves produced on receiving sounds of different wavelength (EEG – EEG measures voltage fluctuations resulting from ionic current flows within the neurons of the brain2). If the brain wave patterns is unchanged when sound is produced the sound is not heard. The test can tell if the cat is totally deaf, deaf in one ear or has normal hearing. Testing cats for deafness — Sources: 1. Cat Owner’s Home Veterinary Handbook. 2 Wikipedia. This entry was posted in Cat Anatomy, Cat Health and tagged cat health problems, Deaf cat, testing cats for deafness by Michael Broad. Bookmark the permalink.